Natural Horsemanship; creating a bond between horse and rider, while working with horses based on the horse’s natural instincts and methods of communication. Wade trees make darn good saddles. They are built and designed to make you a better rider, naturally. You don't have much choice but to ride in the correct riding position, and therefore, to ride one is to fall in love with one. It can almost feel like cheating. Furthermore, Bob measures your horse before he even starts making your saddle to ensure your new saddle will fit your horse as well as you. Don't all saddles fit all horses? What does your horse say? Look at your current saddle and evaluate what your horse is telling you about it with his body language. Is he moving forward less freely under saddle than you'd like? Is he unhappy with the saddling process (pinning ears, tail swishing, moving away, hollowing back, nipping at the girth etc.)? When you mount your horse does he toss his head and hollow his back? Look at the sweat pattern on your horses back after a long ride. Can you see an even contact pattern of the saddles tree from front to back of the saddle? No? These signs may point to an ill-fitting saddle. Bob eliminates these issues starting with the proper tree. Short, stout horn built for dallying. Wood post horn (not metal) that is part of the laminated layers that create the fork. This construction allows the gullet area to be scooped out without sacrificing strength, and allows the saddle to sit lower on the horse. The bars of the tree have more surface area in contact with the horse's back than most other western trees, providing better weight distribution. Stirrups are hung directly under the rider, placing the rider in the optimal balanced riding position. Bob was fortunate to be born and raised in northeastern Oregon, part of the western United States that produced some of the founding fathers of this movement. Tom and Bill Dorrance and the Cliff Wade ranching families (after whom the Wade Tree was named) were legends in his home county. As a boy, he had the honor to ride in their shadows. "The land we rode on dictated their saddle design choices; so incredibly steep and unforgiving was the Hell's Canyon and Grand Ronde country that a cowboy with a rope on a cow needed to be able to separate himself from his horse and free his horse from the cow in a split second lest the unfortunate, stumble footed bovine pull the whole outfit over a cliff. You can build a Slick Fork Saddle without knowing its origins, but something is gained if you understand the 'why' from personal experience. The same can be said for choice of materials;the very best is none too good when equipment failure is not an option. This is the spirit that I strive to incorporate into my work." Bob Trezona was given 100 percent disability following his discharge from the service in Vietnam, but he never quit living. He worked as an outfitter’s guide until his injuries wouldn’t allow for that to continue. He then learned to shoe horses to support his family. 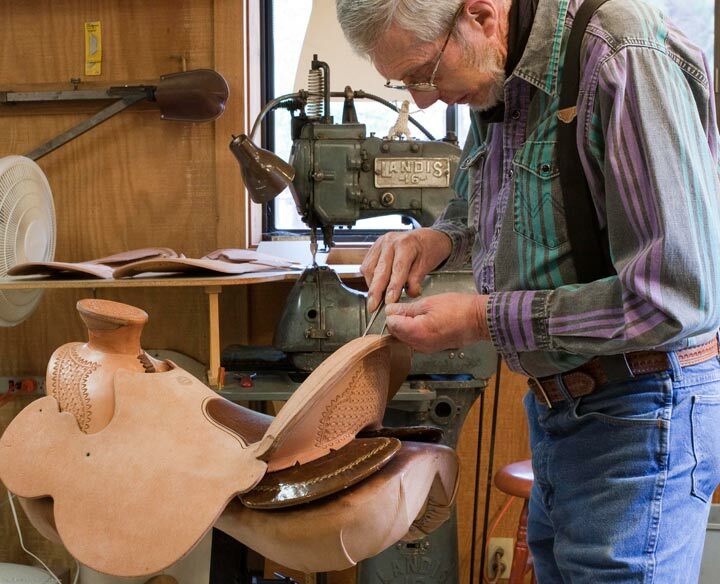 When his body told him he couldn’t do that any longer, he taught himself how to build saddles. 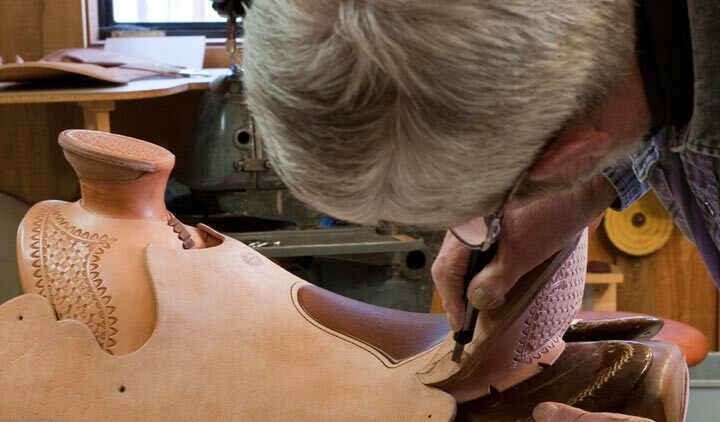 Today, his workmanship is so well known that he has enough saddle orders to carry him through the next two years. Bob Trezona grew up knowing what it meant to be a man. Work harder than anyone asked. Don’t complain, no matter the circumstances. And always do your best to be polite. Trezona doesn’t consider himself a hero. And on Veterans Day, he said he always thinks of all those others who have served. “I’ve just worked so hard through my life to be considered normal again,” he said. “I still enjoy talking about my days in Vietnam, but it’s not what defines me. So much has happened between then and now."